What the New Wayfarer did for the classic Wayfarer, the Ray-Ban Carvan does for the classic Aviator. Or more accurately, has been doing for the aviator off and on since the late 50s. Like a suit, you want to wear the sunglasses. You don’t want the sunglasses to be wearing you. And that’s tough to do with a traditional pair of droopy, portly aviators. Sure they look great on some guys, but for many of us, they look awkwardly ginormous. The Ray-Ban Caravan’s shape chops the lens sag at the bottom and thus, makes them proportional for most faces. They’re a little more angled, and that’s a huge improvement. For the Goldish/Arista Color, go Direct through Amazon for $86.68 (J. Crew charges $125). For Silver, try Eddie Bauer w/ code June20 for 20% off, which drops them to $100. For everything else, (like the darn near perfect gunmetal), looks like it’s direct through Ray-Ban. Cheaper and somewhat similar options include The AO Original Pilot, and The Lands’ End Canvas Square Aviator. Or… if you just won the lottery, there’s the completely over the top expensive Ray-Ban Ultra Caravan. The frames are 18k gold plated titanium, come with polarized lenses, and tortoise shell patterned ear pieces. For $480. Sell a kidney to protect your eyes? i’ve got a pair of the ao pilots. much better in my opinion. built much more sturdy. I’ve been wearing Randolph Engineering’s square aviators for a while now, and those are my absolute recommendations. They’re light, sturdy, and can be found most places for under $100. I have the AO version too, and I didn’t find it as good (they were heavier and felt cheap). You’ve got mjs up top saying the ao pilots are built better than the Ray-Bans, and then raptorrapture says the AOs felt cheap. Always interesting to see opposite opinions right next to each other. Now, all I’m sayin’… is I dig the squared off lens shape and proportion of lens to frame and bridge. Another recommendation for the American Opticals. I’ve had mine awhile. Well-built. these look very similar to the fossil aviators you posted up a while ago joe. I ordered some AO Pilots last night after reading about them on another style blog. They were around $54 shipped. Yes! I’m glad to see a recommendation for squared-off aviators. Some of us really cannot pull off the droopy and rounded traditional aviators (*raises hand*) but still want the thin metal frame. Thanks! I own the Mosley Tribe Santino. They are the same shape and by far the best looking, and highest quality sunglasses that i have ever worn. Were they both poly lenses? The glass lenses will be heavier, obviously. I have AO’s, and have held RE’s; they both felt pretty much the same to me, as far as build quality, but maybe I’m just confirming my own biases. I like both the AO and the RE’s with the bayonet arm, vs. the standard hockey stick. The third alternative, the curved ear piece (called comfort band by AO) looks cool, but was, in fact, the UNcomfort band for me. Maybe if your nose-ear dimension is smaller than on my gigantic noggin, you can get away with those slick lookin’ arms. 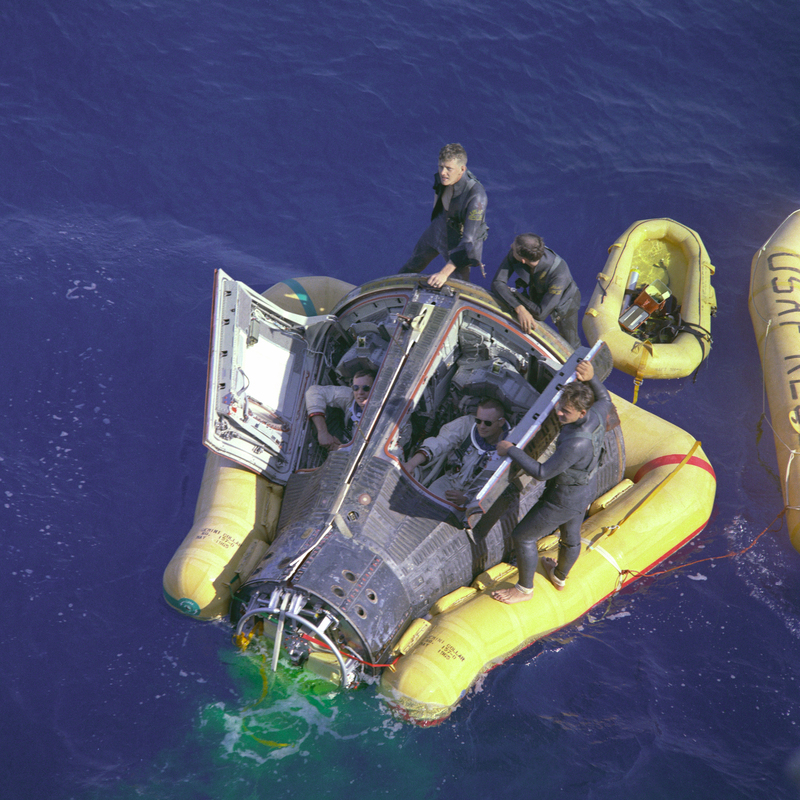 after splashdown, wearing their American Opticals.